The bones of a mid-century ranch house with an even earlier pedigree, combined with exquisite Craftsman detailing, converted what had been a lackluster property into one of the most appealing and engaging homes in the prestigious Margaret Place Historic District. The house started modestly in 1919, and was added to and remodeled periodically since then. Several years ago, a previous owner used an extremely accomplished approach to style and design to rework decades of remodeling and remuddling both interior and exterior. It’s been tailored for success and it’s an asset to the neighborhood. Subtle color choices and measured massing ease this house into its surroundings. Tour guests will be surprised at how large this beautiful home actually is. The welcoming porch features tapered square wooden columns, a Craftsman/sawmill characteristic. The porch, columns and siding reflect the lumber heritage of the historic Coastal South. The interior features sophisticated public rooms and graciously appointed private spaces in an intriguing layout. A generous family room is located in a perfectly private rear wing. There is a sheltering nature to the home, a secure nest for the family that lives in it. As you tour the home, take note of the beauty and utility of the family pieces that grace the rooms. There are personal touches everywhere that make the house feel like a home. The current owners, a young family with children, benefit from the convenient and central location of the property, close to the busy downtown, close to work, close to school and a quick ride to the amenities anywhere in town. This house is in a City-recognized Historic District and subject to design guidelines and review. The Margaret Place Historic District reflects the housing character of the post–Great Fire expansion of Lake Charles. It was developed on what had been Margaret Perkins’ farm and pastures. This area was traditionally separated from downtown lakefront Lake Charles by Pithon Coulee on the northeast. At the time, Pithon Coulee was more like a freshwater cypress swamp and crossing it from downtown required either a streetcar or carriage ride around it on Ryan, or a more romantic stroll on what was then called “Lover’s Lane,” a raised wooden walkway from Clarence Street. Post fire, the streetcar lines were extended, Margaret’s farm was converted to a residential lots for sale, and this edge of the new subdivision was renamed Park Avenue (in honor of Lock Park at its high end). Homes began to be constructed starting with the Leon Locke House in 1912 and construction continued for another half-century onwards. Margaret Place houses are in a variety of styles and shapes, from picturesque English cottages to Moorish inspired villas, but the majority of the houses are solid bungalows with Craftsman details, just like this one. 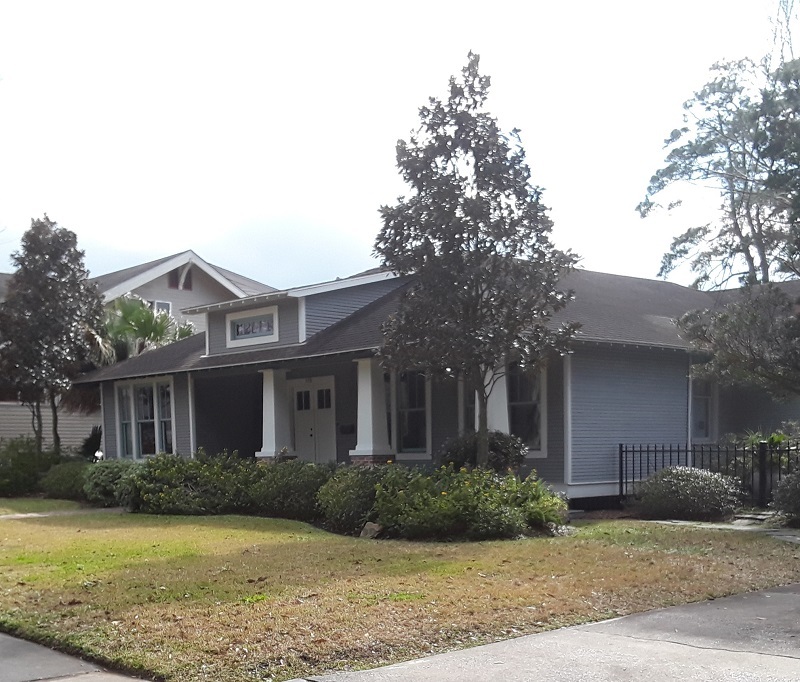 Then a highly desirable part of the growing city of Lake Charles, Margaret Place remains in the center of value and style and is as desirable today as ever. ... a previous owner used an extremely accomplished approach to style and design to rework decades of remodeling and remuddling.